I write articles, novels and nonfiction books. « “Clare” is on Sale for Christmas! 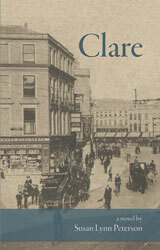 In honor of St. Patrick’s Day, I’m offering coupons on “Clare.” If you order from CreateSpace enter code SC679HTR to get 30% off. On Smashwords enter AL29U to get 30% off the e-book. Tell your Irish friends. (Hey, tell your non-Irish friends, too!) The offer is good until the 17th.